I never could have imagined myself actually owning a tractor of any size just a few years ago. Growing up in Wellesley, there was no shortage of tractors in my life, but I certainly had little interest in them aside from their usefulness in hauling wood out of Schneider's Bush. It was my brother, who had the love for all things farming. He was the sort of fellow who actually rolled the windows of the car DOWN when we passed a manure spreader to enjoy the odour. I began first considering a tractor when we were very seriously negotiating to purchase a different property. It had a beaver dam and creek separating the driveway from the best location for a cabin or homestead, so it was decided that a road must be built across. Clearly a tractor was in order, and, as such, I began learning the basics - but nothing too serious - I would save that for if we actually bought the land. When we didn't, I let my interest wane. Now, though, we are again in the same situation. There is a distance of low lying land between our entrance, and the most likely spot for us to build. It seems to me that the most economical solution will be to have my own compact tractor and either dig my own gravel, or still have it trucked in, and I will handle the job of pushing it around. As soon as the ink was dry on our paperwork, my wife and I decided to take a drive around the area, researching both tractors, and solar power. Our first stop was Rosslyn Service. They had a gorgeous Yanmar/Cub Cadet there, but, at $13,000.00, it was just fun to kick the tyres and move on. We stopped in town at a number of solar power outfits, but I was disappointed at how they all seemed intent on either grid-tie systems, or on just doing everything for me. I'm of the mindset of starting very small, and learning the ins and outs myself as I go along. It was not a little frustrating, but I'm trying to take it in stride and it gives me more time to do my own research into the subject. Our last tractor stop of the day was at The Chainsaw Centre - right in town. They also had some really beautiful Kubota machines. But again, the $14,000.00 price tag made it simply another educational field trip where I could learn a bit more about what was available, and how the technology has changed (or not) over the years. So, for the past number of months, I've been subscribed to the compact tractor alert on Kijiji. 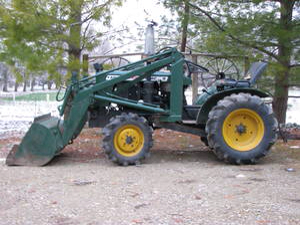 It appears that most compact tractors with a loader seem to be going for around $6,000.00 to $14,000.00 (yes, even used!) - so when I saw one nearby for $4,500.00, I bookmarked it and began a few very tentative questions. Eventually I realized that it wouldn't hurt to go out and see what an older, used machine was still capable of. My brother graciously agreed to accompany me on a short road trip, and we were both really impressed with the condition of this little Yanmar YM155D. I made an offer, which I was accepted, and yesterday I took delivery. Thanks to the kindness of friends, I have the use of a garage for the winter, so I had her dropped off there yesterday, and got her tucked in safe and sound.